In my role as a book reviewer and self-directed photography observer I increasingly gravitate toward publications that don’t just please, amuse, or reinforce my preconceptions of what constitutes a good photography book. I don’t feel qualified to make up a top ten list; to do so would be to suggest that I’ve glimpsed a large-enough percentage of the year’s releases to judge which are the most accomplished or outstanding compared to the rest of the year’s field. I’m not sure how anyone even finds the time to open enough packages to do that these days; how many new titles has the image-publishing world brought to our attention this year? I feel like I saw scarcely enough 2012 releases to retain “browser” status, let alone serve as a year-in-review, photo-bibliophile arbiter. I think Alec Soth probably has a decent handle on the market, given all the books people send him. I found confirmation, befuddlement (so much I’d not heard of, let alone read), and even inspiration (Juergen Teller, what a hoot!) from his recently released list. I have cavils and quibbles with some of the titles on his list that I have looked through; in the case of Anthony Hernandez’ Rodeo Drive, 1984 my feeling was one of disappointment that it wasn’t better. I’d carried a fascination with that work since first seeing it in Aperture, circa 1985, and wanted to have a better re-encounter with it. I’m enthusiastically with Alec in his admiration for Ron Jude’s Lick Creek Line and J Carrier’s Elementary Calculus; they accrue meaning and implication with every reading. 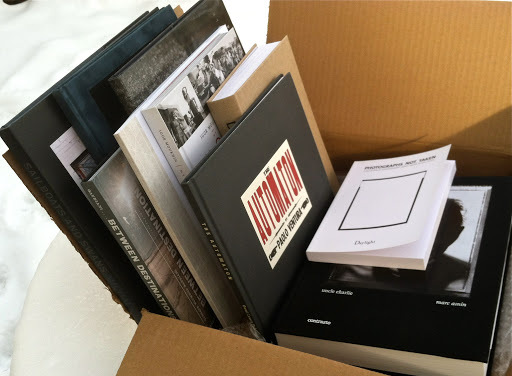 And I do mean reading, or whatever one calls the closest attention one can give to photography’s non-linear narratives–glancing through these books (especially from back to front) scarcely scratches their accomplishment. What I want to do in re:photographica, year-round, is draw attention to books (images, themes, exhibitions, photo-phenomena, etc.) that move me. New slants on the medium that have shown me something either in or within photographs I wasn’t sure I needed, or would ever be likely, to see. Images and texts that get under my skin, that won’t leave me alone, that claim or alter an enduring chunk of my visual memory. Like Hernandez’ views of over-processed, narcissists in the Rodeo Drive consumer ecosystem, with the benefit of hindsight and perspective. And always minding the caveat that great photographs don’t necessarily make great books. The absence of realized images in the former and the dominance of considered ethics/politics in the latter characterize these good reads. Although most photographers do better writing with light than with words, there must be something about the “ones that got away” or were decided against that prompt eloquence. Coleman, for anyone who doesn’t know, is one of photography’s great agonistes. For over forty years he has served as a critic, in the truest sense of that word, on behalf of photography’s better angels. His observations will always stir feelings in me, whether my head is nodding in agreement or shaking in opposition. A brilliant idea, executed with straightforward precision. An alphabetical list of German cities, each represented by name and one image. Illustrations tipped on to front and back covers. No dustjacket. Gorgeous, clean, and conceptually hefty, Deutschland makes me eager to seek out this Swedish photographer’s previous books. I have reviewed two earlier volumes of this sad chronicle of man’s eternal inhumanity to man. I can’t sufficiently stress its importance, but I will continue to cite it until its reason for being fades. WIIGF? You know the answer. Over several years I have seen Gaudiani’s work evolve and expand in four series related to views from moving trains. I was never sure, though, how it could possibly become a book. Guadiani found just the right team in San Francisco; Martin Venezky’s Appetite Engineers performed the miracle of replicating the flickering transience of these images while still respecting the case they make for the transformation of American landscape. Brava, Candace. I wrote about this for photo-eye online earlier this year. And I still find it moving, both wondrous and unsettling. It lasts. A sprawling and alluring mess of a book, veering from sublime to repulsive, but rife with the energy of an insider both recording and experiencing the uneasy maturation of a formerly repressive society. There is skill here, though it takes a back seat to testimony and exuberance. To edit this more strictly would be to dilute its compulsive thrust. Like Moukhin, Asnin is emotionally enmeshed with his subject. And like Moukhin’s book, Asnin’s teems with an overabundance of descriptive wealth, from the 30 years of photographs to the edited and insinuatingly typeset conversations between the photographer and his tough-guy uncle. A remarkable hybrid view into the life of a troubled soul. From out of the blue this sequence of reproductions of poured emulsions opened on my table; I was unprepared for the impressions they made on me. And continue to make. This is one of those great photo-books that allows you to experience individual images as well as appreciate Twin Palms’ typically outstanding editorial work that fashions a page-by-page evolution, one image segueing into the next to create an acutely detailed yet ultimately inconclusive narrative. You couldn’t tell a story like this without photographs, and you couldn’t tell the story these photographs tell with words. Chelbin showed her work at the PRC in Boston shortly after I arrived there. I had heard about the work in prisons that we weren’t able to show. I think that work, which shows up in this new volume, probes into dark areas of juvenile dysfunction that we aren’t meant to experience in everyday life. Not to sound paranoid, but I find these imprisoned youth extremely unsettling, and have a hard time grasping what it must have been like to make these unusually tender portraits in such harsh circumstances. Chelbin has a singular purpose, and photographing may make her invincible. I have two good reads to cover in separate posts. But I needed to get this one done first; all that pressure, time running out, etc etc. Stay tuned for Peckerwood revisited and two books by Lewis Koch. and happy new year to you george. Bravo, George, for a hard look at these good books. I had to smile when I found your new post by clicking from Coleman's blog this new year's morning as I was planning to ask if you keep that one tuned in.A circle of critical mass clicks. Bravo.